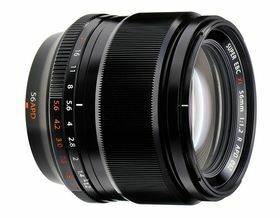 The FUJINON LENS XF56mmF1.2 R APD offers brilliant levels of sharpness even when shooting with the aperture at F1.2. In addition, the apodization filter smoothes the bokeh's outlines. This combination of image sharpness and beautiful bokeh delivers portraits with a three-dimensional feel. An optical construction of 11 glass elements in 8 groups, including one aspherical glass moulded lens element and two extra low dispersion lens elements has been used. Spherical aberrations are corrected by the aspherical glass element to deliver high resolution at the maximum aperture setting. Additionally, thanks to the combination of two extra-low dispersion lens elements and three cemented lens elements, chromatic aberrations are greatly reduced. The lens also makes the most of Fujifilm's unique X-Trans™* CMOS low pass filter-less sensor for extremely high image quality. Ghosting and flare are controlled even under harsh conditions such as backlighting. By combining this lens with an X Series camera body** with Lens Modulation Optimizer*** (LMO) technology, the performance from the lens is improved even further. LMO corrects for diffraction*4 to produce images with edge-to-edge sharpness and create a realistic three-dimensional effect, even at small apertures.